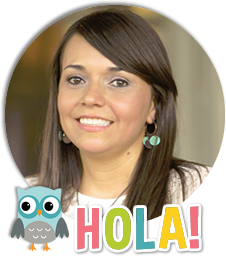 Mi Salón Bilingüe: MATTER: HANDS ON SOLIDS! c) I have an extremely low copy allowance in my campus, so our journals won’t look Pinteresty cute but will be full of note taking and create-your-own table kind of thing. Then we learned about the properties of solids, just solids. I paired them up and gave them a baggy with items such as a cable, a plastic triangle, a piece of fabric, a wood cylinder, a popsicle stick and a plastic tube. 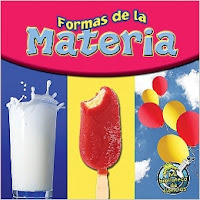 I got all of these items from the Foss Kit Solids and Liquids, which is provided by our campus. We used a comparison table also from the Foss Kit to go over the properties. 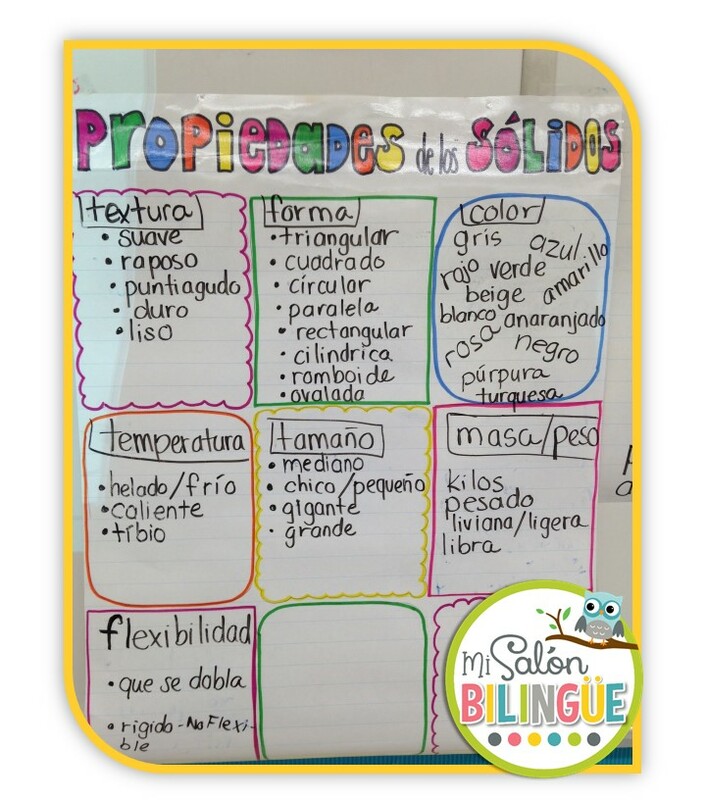 The vocabulary used in the table (flexible, rigido, liso, áspero, suave, duro, tiene color, puntiagudo y plano) was introduced beforehand; then I gave them a couple of examples on how to fill it out. That's all, they did all the exploration! When they finished, we shared answers and students were able to correct their answers if they needed to. After that, we used our anchor chart PROPIEDADES DE LOS SOLIDOS to write down words that described each property (Do you see how this can be related to adjectives? (wink)) . They got the concept very well I have to say, and by now… oh boy!... they were all speaking properties all the way. 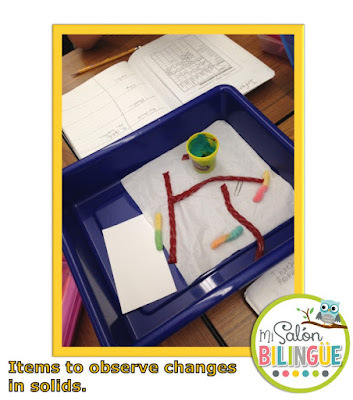 Our following lesson was called: Changes in solids. In a tray, I put gummy worms, twizzlers, paper, a paper clip, an index card and play dough. The kids were allowed to freely explore all possible actions with these items. Of course they wrote many verbs even “EAT” and “SHARE” in their journals. 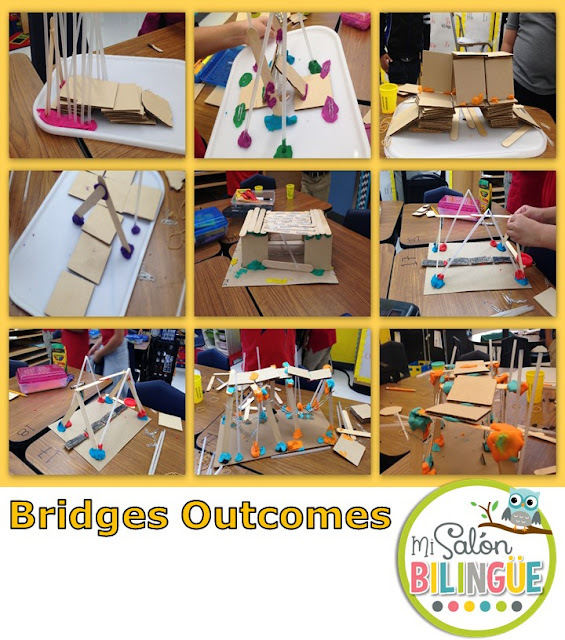 To culminate our lesson on solids, we built bridges made with materials that had different properties. We did it in the form of a TOP CHEFF or CHOOPED challenge, where they had exactly 30 minutes to come up with a functional bridge. 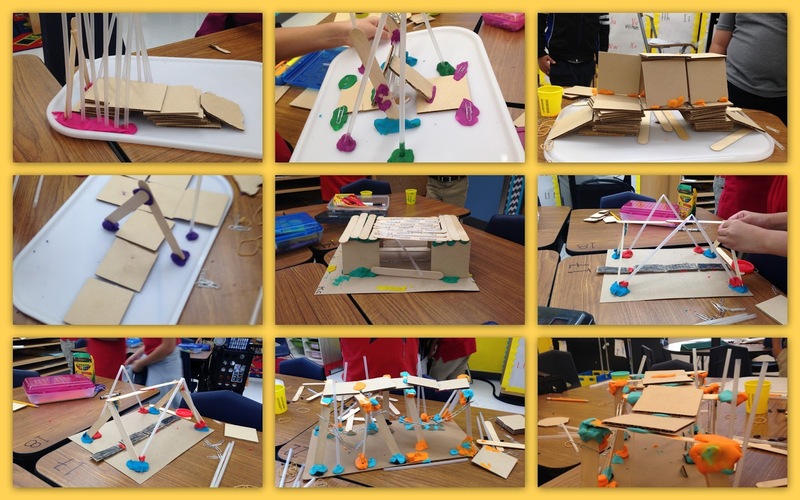 We saw pictures of bridges, they drew a model of their bridge and picked their materials before getting started. My kids loved this part and we had fabulous outcomes (shared on My Class Story from Classdojo so parents could love it too)! At this point they got analytical about what solid would hold up better, what materials would be more useful according to their properties. Don’t miss out on the following posts on the properties of liquids and changes in matter.